Four thousand Scientologists and their guests converged on downtown Clearwater for a ribbon-cutting dedication in celebration of the new Church of Scientology Information Center on Saturday, July 11. The dedication ceremony of the newly restored Clearwater Building was officiated by Mr. David Miscavige, Chairman of the Board Religious Technology Center. He was joined by thousands to celebrate the opening of a complex of seven buildings spanning an entire city block. The ribbon cutting Saturday, July 11 of the Church of Scientology Information Center was celebrated by thousands in Clearwater’s downtown corridor. In his closing remarks, Mr. David Miscavige welcomed all in attendance to tour the Scientology Information Center and the new humanitarian headquarters. Scientologists and their guests toured the Clearwater Building, eager to see the facilities designed to provide a definitive introduction to the religion. After the opening ceremony, Scientologists and their guests toured the new centers to see the facilities and to sign up as volunteers to bring these vital programs to the community. The excitement from the dedication spilled over into the streets, with thousands touring the entire block of facilities, ready to bring the community together in the name of social betterment. After the grand opening, guests also streamed into the Osceola Courtyard to view colorful pavilions for each of the humanitarian and social betterment activities. The new Scientology Information Center stands front and center in the downtown corridor at Cleveland Street and Fort Harrison Avenue in the historic Clearwater Building. The Church completed an elegant restoration and upgrade of the historic Clearwater Building, including the grand lobby that houses the new Scientology Information Center to provide a definitive introduction to the religion. Philosopher, humanitarian, author, artist, educator and administrator—the L. Ron Hubbard display presents the many facets of his extraordinary life. The expansive new Scientology Information Center further features a display on the panoply of social betterment and humanitarian programs now the hallmark of the Church the world over. The new Scientology Information Center is located at the corner of Fort Harrison Avenue and Cleveland Street at the apex of an entire block of facilities where Church-sponsored social betterment and humanitarian programs are available to the community. The Church of Scientology has created six new offices for internationally renowned humanitarian and social betterment initiatives it supports, each addressing crucial social problems with effective programs to uplift society. The Scientology Volunteer Ministers center—like the Volunteer Ministers themselves—provides help whenever and wherever it’s needed. The new Citizens Commission on Human Rights facility on Fort Harrison Avenue provides the resources for community activists to work together to eliminate brutal treatments, criminal practices and human rights abuses in the field of mental health. The new United for Human Rights center stands as an unwavering commitment to broad-scale rights education throughout Clearwater and the Tampa Bay area. Foundation for a Drug-Free World’s new headquarters is dedicated to eradicating drug abuse and providing meaningful drug education to young people throughout Clearwater. The Way to Happiness center in downtown Clearwater, Florida, mandated to deliver the common-sense moral compass for daily living set out in The Way to Happiness. At the Clearwater Criminon center, volunteers can coordinate programs to help offenders restore their self-respect and so return to society as responsible members of the community. Saturday’s ribbon-cutting also celebrated the unveiling of the Osceola Courtyard, the new park created by the Church of Scientology, which will host the annual Winter Wonderland, a popular family tradition provided to the community by Scientologists for the past two decades. The Osceola Courtyard will be set up with colorful pavilions during holiday events to make available each of the Church-sponsored humanitarian programs. The new Osceola Courtyard, a beautiful addition to downtown Clearwater at the corner of Drew Street and Fort Harrison Avenue. The Church’s six global humanitarian initiatives come together in a single Florida location to benefit all citizens, giving a much-needed local home to Church-sponsored international programs at the intersection of help and hope. Four thousand Scientologists and their guests converged on downtown Clearwater for a ribbon-cutting dedication Saturday, July 11, in celebration of the new Church of Scientology Information Center, expanding the religion’s renowned and globally impactful humanitarian programs into a central expansive hub astride the religion’s spiritual headquarters, the Flag Land Base. The Clearwater Building and Information Center represent the completion of the Church’s next phase and includes six distinct facilities dedicated to the local advancement of Scientology-affiliated global humanitarian initiatives. It follows the dedication of the Flag Building, the Church’s international spiritual headquarters, in November 2013; the opening of the historic Coachman Building in 2014, with its permanent exhibit dedicated to Clearwater’s history; the full-restoration and rededication of the landmark Fort Harrison, connected with the Flag Building by a street bridge spanning Fort Harrison Avenue; and the opening of the Oak Cove retreat. The landmark Clearwater Building stands front and center in the downtown corridor at Cleveland Street and Fort Harrison Avenue in the historic Clearwater Building. Originally built in 1918, the structure has been beautifully restored with its grand lobby transformed into a Scientology Information Center. Clearwater is known as the spiritual headquarters of the Church of Scientology, and to answer questions about the religion for residents and those visiting the city, the Church opens the doors on this information center. 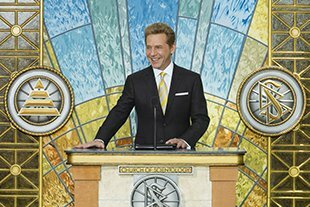 “Today signifies a watershed moment for the city of Clearwater, home to our spiritual headquarters," pronounced Mr. David Miscavige, Chairman of the Board Religious Technology Center, in addressing the assembled throng. The panoply of humanitarian programs now the hallmark of the Church the world over. Additionally, each of these humanitarian programs now has its own facility just steps from the Information Center. Never before have so many individual buildings serving Church-sponsored humanitarian initiatives been erected in the same location to enlighten those seeking assistance and guidance. They represent a helping hand for Clearwater and the greater Tampa communities. To that end, the Church embraces its role to work hand-in-hand with local law enforcement and government officials as well as church and civic groups and the entire nonprofit community to do its part in helping to build a more vibrant city. Now a worldwide movement expanding across 184 nations, the Church of Scientology has been a key player and loyal resident of Clearwater for nearly 40 years. Clearwater is the permanent home to more than 10,000 Scientology parishioners. Moreover, tens of thousands of Scientologists travel to the city each year from around the world to participate in religious services at the Church’s spiritual home. The Church takes seriously its responsibility and interest in the future of the area. The center’s dedication accompanied the simultaneous opening of six facilities along an entire block of Fort Harrison Avenue, each committed to a single global humanitarian initiative and devoted to the betterment of Clearwater and the Tampa Bay area. The Church’s goal with the new open-door facilities is to provide help for any in the Clearwater and Greater Tampa Bay area who seek it. Saturday’s ribbon-cutting also celebrated the unveiling of the Osceola Courtyard, a green oasis that is an anchor for the community, beautifying the city at the corner of Fort Harrison Avenue and Drew Street. It will be set up with colorful pavilions during holiday events to make available each of the Church-sponsored humanitarian programs. The park will also be home to Winter Wonderland, a popular family tradition provided to the community by Scientologists for the past 25 years. Scientology has enjoyed greater expansion during the past decade than in the previous 50 years combined. Indeed, the first half of 2015 has been marked by historic achievements for Scientology. They include this weekend’s dedication of the Scientology Information Center in the restored Clearwater Building, along with six new Clearwater headquarters buildings to make Church-supported humanitarian programs readily available to the community; dedication of the majestic Ideal Church of Scientology in Bogotá, Colombia, on July 5; and the opening two months ago of another Ideal Church of Scientology where France, Germany and Switzerland converge: in Basel, Switzerland. More openings are planned in Asia, Europe and North America in the months ahead.